For better or worse, alcohol has been integral to the American experience from the very beginning. Initially drawn from Old World traditions, a distinct drinking culture gradually developed in this country. Woven into the fabric of national life over the course of 400 years, the relationship between alcoholic beverages and the people has been enduring—and at times tortured. Most of us are familiar with national Prohibition era (1920–1933), but are probably less knowledgeable of earlier anti-alcohol movements. The roots of Prohibition lie in the nineteenth century. For a good part of that century an intense struggle was fought between the “wets” and the “drys” over the degree to which society should accept “spirits” and other forms of alcoholic drink. Lynchburg was no different. The General Local Option Act of 1886 allowed local governments throughout the Commonwealth to hold referenda to determine whether or not liquor and other intoxicating beverages could be bought and sold. Lynchburg held several referenda in the late nineteenth and early twentieth centuries. While the “wets” proved victorious in most contests, the “drys” had their way in 1908. This prohibition, however, was overturned by another referendum less than two years later. The intense backand-forth struggle underscores just how central alcohol-related issues were at the turn of the century. Carry A. Nation is one of the most visible, yet least understood figures of the prohibition movement. When she arrived in Lynchburg on August 3, 1907, she was preceded by her reputation. 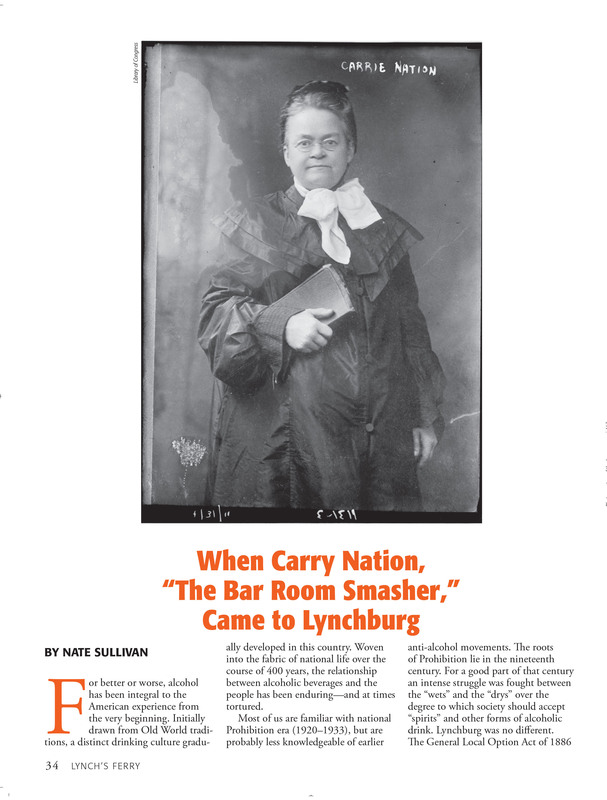 Hill City citizens welcomed “The Famous and Original Bar Room Smasher” as a national celebrity prone to deliver stunts; whether or not townsfolk agreed with her radical prohibitionist stance was beside the point, this was Carry Nation. Her fame garnered universal attention. When she came to town, people turned out, hoping to witness a spectacle. Nate Sullivan is a middle school history teacher at Bridges Child and Adolescent Treatment Center, and an online history instructor for Remilon, LLC. He holds a M.Ed. from Liberty Universityand a M.A. in history from the University of Nebraska at Kearney. This is his second article for Lynch’s Ferry. He has also written for Skirmish Magazine, War History Online, and other publications. Nate is an historical reenactor and a collector of World War II militaria.